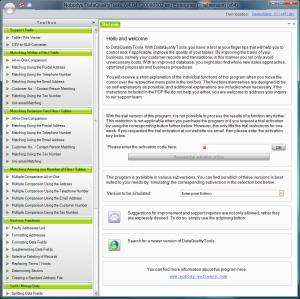 DataQualityTools 4.1 - Download Win Apps. Collection of tools to help businesses improve the quality of their databases..
DQT is a collection of tools to help businesses improve the quality of their databases. The central components are a series of functions which help to find duplicate records (deduplication software) and, above all, a function for error-tolerant doublet search based on postal addresses. This allows you, in the case of direct marketing, to avoid double solicitations and the redundant maintenance of customer addresses and other records. OraDeveloper Tools integrates into Delphi and lets you quickly browse, query, and update Oracle databases directly from Borland Development Studio. Features include easy object manipulation, visual query building, and extended scripting support.